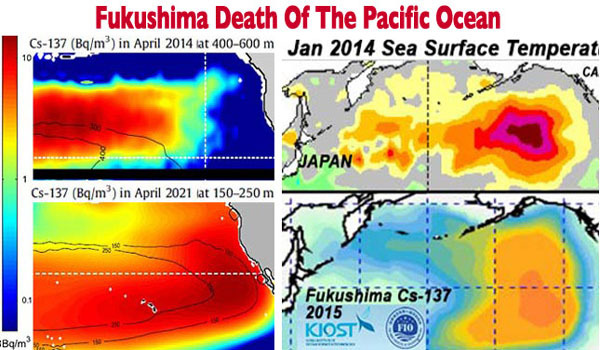 Is it just a coincidence that just days after a report is released by ENENews that the leader of the Fukushima study stated that “Intense” radiation exposure was headed towards the US west coast with a plume traveling very fast and that “high concentrations” would impact the west coast with a prolonged period of radioactive upwelling expected, the highest of readings in San Diego, California and Albuquerque, New Mexico, suddenly vanish, go totally offline, and when they reappear those numbers have dropped by hundreds of Counts Per Minute? 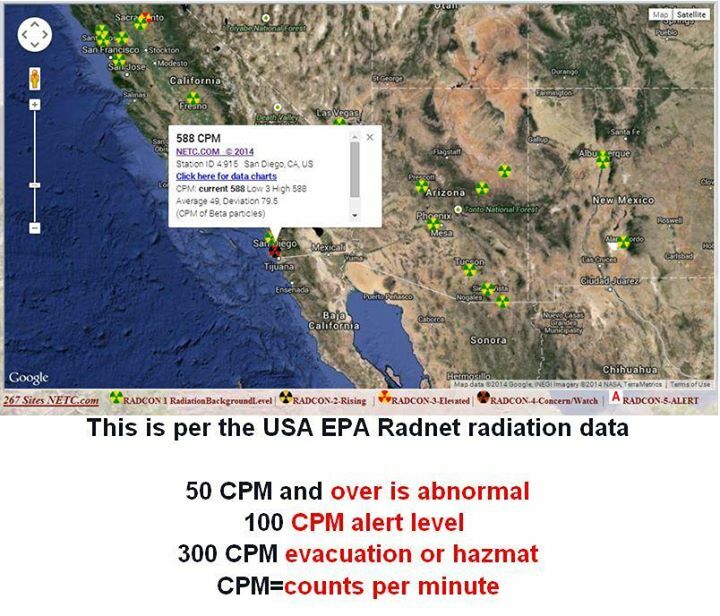 Mid America Land Restoration / Microbes / Probiotics has been documenting the radiation readings across America for quite a while now on their Facebook page, and thanks to them we have the images from 9/18 – 9/20, showing extremely high levels of radiation, via the Nuclear Emergency Tracking Center. Using those, with images from this morning, show that something very strange has been going on. Whether the NETC site was hacked or “coincidentally” these particular areas went offline and then returned showing levels massively lower than right before they went offline, we have no way of knowing. The first image is from “Friday NIGHT, Sept. the 19th of 2014 These numbers was pulled at 11:00 P.M. Central Time ….” shown here. The image below was taken by this morning, a little after 7 AM on September 21, 2014, also shown in the video below. 588 CPMs before going offline and miraculously down to 187 two days later! 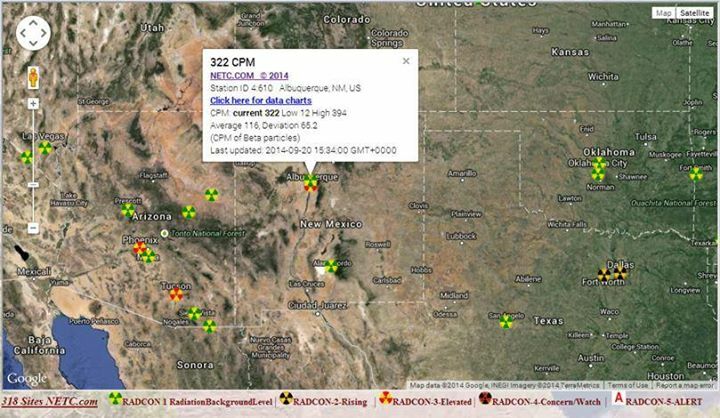 In case others think that it is an anomaly or coincidence, let us move right along to Albuquerque New Mexico, where again Mid America Land Restoration / Microbes / Probiotics observed and documented the radiation CPM levels on September 20, 2014, showing 322 CPM, updated on September 20, 2014. As of 6 AM on September 21, 2014, Albequerque too had simply vanished off the NETC map, but by 7:30 AM, they were back online and the readings….. dropped there as well to 90 CPM, shown in my screenshot below. I have emailed NETC to ask for an explanation of why they went offline, or if they were hacked, but that was at 6 AM, so no response has come back as of yet. If and when they respond, this article will be updated. Some VERY strange is going on with these readings and circumstances, as well as the timing considering the ENENews article linked above. The data you quoted comes from the EPA radnet government webpage. Netc only reports the data it receives, no hacking, no modifying the data by Netc.com. If you read the EPA webpage you will learn that government takes down each station when unusual event occurs, like high radiation readings. The EPA takes out the filter from the station and sends it to the lab, to find out what type of radiation was detected. Then they install a new filter and turn the station back online. Each station is maintained by different groups like the Little Rock, AR unit is maintain by the Health Dept. and the Fort Smith, AR unit is maintain by the University of Arkansas. So maintenance will very at each station. Netc.com must live with the facts that it is not a perfect world and radiation moves like the rain storms that everyone knows about. P.S. check the fact that the US Ronald Reagan Aircraft carrier came into San Diego Navy Port last week???? It could be the reason for the high radiation readings that EPA station received. More Elitist gov’t self-created false flag nonsense in order to perpetuate the lies that we need GMO’s and other insane abominations of science. What i mean to say is that the accident was no accident, and they meant to make fukushima go up in smoke as a part of their eugenics depopulation agenda. Make no mistake about it; there is nothing strange or coincidental about the US government manipulating and concealing the amount of radiation coming from Fukushima. The unintentional and intentional discharge of toxic levels of radiation from Fukushima is more than sufficient to irradiate & poison the entire northern hemisphere and every kind of animal, vegetable and all other forms of life there. Every life form in the Pacific has been affected and is either sick, mutated, dying or dead. It’s comical and absurd that the US government is treating Iran as the single largest global nuclear threat. So why is the US government deliberately concealing the toxic radiation levels that have and continue to poison the Northern Hemisphere? Well the answer is very simple. It is much cheaper to control the depopulation of the US, buy millions of body bags and stockpile millions of cheap coffins than it is to tell the truth to the American people. Well let’s just see if the people who are sick & dying from radiation poisoning will appreciate their access to health care and they are the lucky ones. Everyone who will be unaffected will have to learn how to live without food & water.